The natives won't speak to me in their language! Photo by polandeze on Flikr. 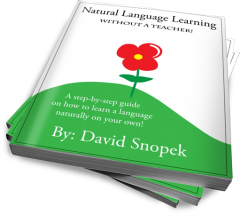 Speaking your target language with native speakers is the ultimate goal of most learners. But what should you do if the people you meet only want to practice your native language? You're not the only one having this problem! How can you get native speakers to stop speaking Engilsh (or your language) and practice their language with you? Read more for some tips! Once a relationship is established in one language, it's extremely hard to change it. Only at the beginning is it really flexible. For example, I have several friends who are native speakers of Russian. I met some of them before I started learning Russian so our friendships were established in English. Later, it was nearly impossible to "translate" our relationship from English to Russian! But I met others after I was already pretty good at Russian, so we began the relationship mostly in Russian. Now speaking English with them seems weird and almost silly! Even if you're struggling a bit, act like you are having a great time speaking the target language. If you look like you are suffering, people will switch to English (or whatever your native language is) because they think they are helping you. I personally had this problem the first two times I was in Poland. I was trying really hard to do grammar mathematics in head. This looked very painful -- and it was! If someone switchs to your language, tell them about your problem (in their language!) and ask them to speak your target language. They'll understand. As I wrote previously, a language exchange is where you meet with a native speaker of your target language, who is also learning your native language. Then you can practice both languages, one at a time. It's also a great way to make new friends! If all else fails, have some fun! NOTE: I've never personally tried this. :-) If you do, let me know how it goes! This problem happens more when you're at a beginner level. Eventually, I started having the problem in reverse! For example: when we were living in Poland and my family came to visit us, we went out to eat a lot in Old Town. All the waiters in Old Town speak good English and even some German, Russian, etc. They would start out speaking to everyone in English but when they found out that I spoke Polish, they would start relaying every communication through me in Polish! How do YOU get native speakers to speak with you in their language? Is it more difficult with with some nationalities? Write a comment below! Good advice, I too have had this problem in Poland, but once you get to a high enough level, it stops becoming too much of a problem. I pretty much follow the advice you have given above. One of my major major annoyances is when speaking to someone in Polish who barely knows any English, maybe a few basic words, and they insist are trying to translate everything I have just said back into English/Tarzan language, e.g. Them: You want coffees, YES! I found the problem is mainly with men, women don't seem to do this. The problem also gets much worse after a few beers :P. I just put it down to wanting to show off, and people have told me not to worry too much about it. Also, I can actually understand women more as the ones I know don't use "k*rwa" in every sentence. Also, I avoid people who like to show you that they can swear in English (and that's it). I've always been scared to try the "Nie mówię po angielsku, jestem klingonem" approach, as knowing my luck the person would speak Klingon. I have heard this works though, but if you forge a relationship with that person they won't be too happy that you lied to them. Właśnie obejrzałem zwiastun "Sala samobójców" i trochę poczytałem o nim. Podoba mi się pomysł z stosunkiem między światem realnym i wirtualnym. Wygląda bardzo ciekawe! I've also heard version "iść na dworze" (with declination kto/co - dworze, kogo/czego - dworza, gdzie - na dworzu) - some people near Kutno use this version. Polish has relatively small regional variations (thanks to post-war migrations I think), so IMHO it's good at least some of such differences are still in use. Profesor Jerzy Bralczyk, polski językoznawca, w poniższym filmiku wyjaśnia, która forma jest poprawna: wyjść 'na dwór' czy 'na pole'? Okazuje się, że "wyjść na pole" nie jest błędem; jest to regionalizm krakowski (i nie tylko krakowski, gdyż osobiście słyszałem również ten zwrot używany powszechnie np. na żywiecczyźnie), ale w czystym, standardowym języku polskim (języku literackim) obowiązuje forma "wyjść na dwór". Poprawnie można więc powiedzieć: "Idę na dwór". Natomiast jeśli opisujemy, że coś się dzieje na zewnątrz budynku, mówimy, że coś się dzieje "na dworze" (np. 'Jurek gra właśnie w tenisa na dworze', ale nie "na dworzu"). Powiedzenie "Idę na dworze" również jest niepoprawne. Przyjedź do Krakowa :) Wychodzenie "na pole" to małopolski regionalizm. I'm not sure she needs my help. :-) She already speaks very quickly and comfortably, much more so than me. If she just learned a little more vocabulary she'd speak perfectly! Thanks for the link, though! I'm surprised I haven't seen this before since its from back in 2009. This is a funny situation that a man who is from another place try to learn the language of the place where he lives now. All the people in that place will try to learn in his language rather than teaching him their language.